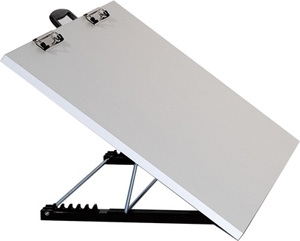 The Scheewe Portable Art Studio starts with a light weight white board with comfortable handle then adds a Clip to hold your block, pad or painting surface while you work. A 6-position supporting ridge helps to bring the work surface closer to you. 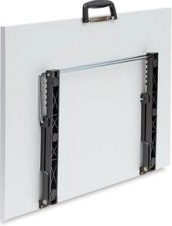 The Board size is 20x26, this model has double clip and adjustable height.